Blackberry is a fruit species in our country, and especially in Bosnia, for many manufacturers of new and insufficiently known cultures, because the production began to be introduced only thirty years ago. As fruit crops, blackberry has great economic importance. Blackberry fruits are suitable and in great demand for various types of domestic and industrial processing, cryopreservation and for consumption in the fresh state. However, the current needs cannot be even close to settle, because the production of blackberries in our small and still largely achieved from natural populations of wild blackberries. Hence there is a need to accelerate the introduction and expansion of production as productive and better noble varieties of blackberries. Quickly coming into bearing, regularly and generously giving birth, fruit quality, easy realization of production achieved at affordable prices and other characteristics make noble blackberry very useful and profitable crop. In addition, in our country there are favorable natural conditions for the production of blackberries on a wide area of lowland to mountain heavy areas. So it is favorable natural resources relatively little exploited. The high profitability of growing blackberries is affected, that in recent years raising amateur and commercial plantation takes shape and is interested in its cultivation of a large number of manufacturers. I was very interested in the production of blackberries because of its biological properties, as well as fruit species, the best varieties to include in his plantation, the method of cultivation, plantation and raising seedlings, as well as the latest developments in the entire process of production and trade of fruits. I tried to use as many of their own results and other experiences, in order to avoid making mistakes, which would later reflect negatively on the success of the production of blackberries. INFORMATION ABOUT THE APPLICANT Mission: Our mission is to promote the agriculture of blackberries to become one of the main driving forces for the promotion of the local economy, because it is an agricultural product that has very low production costs but with the right selling strategy is could be very profitable. Vision: Our vision is to establish one product that could be the fundament of the local economy of Bosnia and Herzegovina and the main driving force which will bring our living standards to a higher level. The main objectives and strategies: Main objective of this project is to find investors which will invest into it. Such a goal is very hard to establish because we are now in a crisis period in which people are afraid to invest into projects which are not 100% profitable. This main objective can be established if we plan everything correctly and put a lot of effort into the project. The first part of this project consists of the description about the local economic position and what are the main problems. The second part consists of strategies how to use best the blackberry fields to maximize the profit. First stage of project will continue to work alongside of the other. Number of employees would be ten to fifteen, with one executive manager, four graduates, one secretary, and nine field workers. 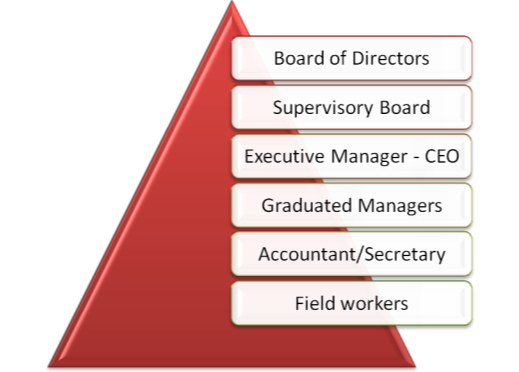 Type of hierarchy would be vertical, where executive manager would be the director and the main decision maker, while four other employees would be subordinated to him in hierarchy. Decision making structure would be simplified, with executive manager on the top. The main idea is to follow the ideas of one person so that it don’t came into the position to deal with two or more strategies, which at the end wouldn’t be successful. Do you have all the necessary equipment for the implementation of the project? As fruit crops, blackberry has great economic importance. It is particularly interesting for growing in warmer areas but near mountain, up to 700m above sea level. These and other biological production and technological features make blackberry very useful and profitable crop. Growing of blackberry is very fast and also returns on your investment. It is necessary for its growing enough manpower, especially for harvesting. To avoid these drawbacks, I chose the plantation earlier varieties of blackberries without thorns, which achieve high yields. Municipality of Bihac – Municipality of Bihac in rural areas will have the biggest benefit from implementation of this project because they will introduce a new branch of berries. Furthermore, budget is expected to benefit due to increased activities. People – unemployed people in rural sector, which is the most affected in our country will directly get an opportunity to launch new small private enterprises or to engage in existing producer groups and thereby provide the jobs for themselves. Furthermore, people who live from agriculture will benefit. The areas around Bihac, as well as the majority of Una-Sana Canton are known for very fertile land for cultivation and production of fruits and vegetables. This production would put special focus on finding reliable partner for redemption of surpluses of blackberry. Firms – which already work on the area of municipality will benefit from the new product, which will expand the offer of companies that are engaged in buying and reselling fruit. Members/Individuals – workers who participate in the work on the plantations of blackberry. Foreign firms – which decides to invest in our country. They will be provided with a high quality product at a very affordable price. First of all, the target will be the market of Bosnia and Herzegovina but considering a good geographical position the target will also be West Europe, countries such as German, Italy, Austria and Benelux countries. This market, European market, has a large number of consumers of this product and major importers of blackberries because of insufficient domestic production. Overall goal of this project is to make a blackberry plantation by European standards and to participate in the European Union market with high quality products. With this move, we would have presented the municipality of Bihac and the Una-Sana Canton, to population of European Union in the best possible way and therefore met them with other products produced around these areas. Attracting FDI to Bosnia and Herzegovina, we can expect new projects and investments that will effect positively our economy and society. Date of last registration: 06.09.2004.god. Repayment period 60 months, 6% interest. 1. What is the subject of investment? 2. How much funding is needed to achieve this? What do you expect of these investments ? 4. It is necessary that the storage space install a small refrigerator, a refrigerated van, increase the surface area plantations, and obtain new varieties of blackberries. 5. From the presented investment, it is realistic to expect the modernization of production and increase capacity. The agriculture should be in every country of the world the main part of the economy, because through the agriculture industry the whole economy of a country could do and buy whatever they want. To increase production, which means security maintenance and expansion of relationships with customers, increase the number of seasonal workers, to fruits have time to repent and placed on the domestic and foreign markets. During each operation must be strictly take into account the quality and the customer is satisfied. Production of blackberries is healthy and does not pollute the environment. Dry branches and leaves burn at the specified location. As we know, to engage in any business must have a business plan, which will be our road map guiding. The business plan provided blackberries are all actions that occur in the production process. Investing own and borrowed capital to be efficient and to bring economic effects (profits). The planning results can provide a variety of efficiency. E > 1, E = 1 or E < 1st. If efficiency is greater than one, the new venture has profit efficiency, we are well planned influx of funds and expenditures, new investments are feasible and possible. If the efficiency is equal to one, we have to modify something in the business plan that we achieve greater efficiency, but also with the efficacy results are possible new investments. If efficiency is less than one, new investments are not efficient, and we have to realize a loss in the business plan of remedying the deficiencies that affect the negative efficiency. This is one of the better ways to verify the success of any enterprise. In addition to a good, realistic planning for the success of the enterprise, it is very important and successful manager, and his task is to produce blackberries presents the domestic and foreign market at realistic prices. In order for products to be competitive in the international market, have to meet European standards. To conduct a business plan which will be completely according to the rules which are set by the ruling, we must first identify what is it what people need in accordance to survive. Contribution to the development of the agricultural segment, through promotions in the ministry parliament. They don’t know if they even can fix them but people are making nervous protests just to become what they have deserved. The most important result is that the development of the blackberry agriculture industry will help the local economy to survive and to earn enough funds to raise the GDP level, the average wage, the standard of living, to pay back government loans and to fund projects in the future whose goal is to establish a working economy with many benefits. For the production of blackberry plantation farming risks are very small because of late starts with vegetation, and there is no danger of frost during the growing season. It is very well tolerated by dry periods, and is suitable for irrigation, since the plantations raised on gentle hills. In the case of lower genus, the number of seedlings is measured in order to achieve the planned profit, which can successfully sell on the market. Monitoring – is the process which will give insight to the stakeholders of this project, and in particular, to the financers. Manager of the project is obligated to send reports about the status of project, planned activities and its progress. Through the monitoring the project manager is going to indicate what is being done good and what is being done bad. These adjustments will be done through communication with the executives in order to come up with the optimal solutions, which will satisfy all members involved in the project. I other words reports about the execution of time schedule, activities and budget, manager will send periodically. To have successful business and raise this firm on a higher level, he will also have meetings, monthly or quarterly with relevant stakeholders. On those meetings, they are also allowed to give their opinion, comments or any proposal which will be discussed among them. Evaluation – of the project will be done by a manager, and he is obligated to use step by step technique, due to fact of small number of employees, and limited budget. This is done because this project does not want for manager to get involved in too many activities at the same and as a result of that, those activities do not get proper execution. He will be allowed to move to next planned activity during the implementation of this project only after the previous activity has been done, or it has moved into final phase. Reporting – As an appropriate persons from the financial side of the project, manager must send periodically reports to relevant stakeholders and executives. Why I opted for plantation cultivation blackberry? Great love for the fruit has contributed to decide for plantation cultivation of blackberries. Bearing in mind that the blackberry fruit crops as very young in our region, its good biological properties, each year he entered the great fertility of high-quality fruits, which have been increasingly used in household, culinary and food industry. Products blackberries are healing, both in fresh and in processed condition. There is a great demand for blackberries, success is guaranteed. "Blackberry Agriculture for Economic Development." UKEssays.com. 11 2018. All Answers Ltd. 04 2019 <https://www.ukessays.com/essays/economics/blackberry-agriculture-economic-7631.php?vref=1>. "Blackberry Agriculture for Economic Development." All Answers Ltd. ukessays.com, November 2018. Web. 19 April 2019. <https://www.ukessays.com/essays/economics/blackberry-agriculture-economic-7631.php?vref=1>. UKEssays. November 2018. Blackberry Agriculture for Economic Development. [online]. Available from: https://www.ukessays.com/essays/economics/blackberry-agriculture-economic-7631.php?vref=1 [Accessed 19 April 2019]. UKEssays. Blackberry Agriculture for Economic Development [Internet]. November 2018. [Accessed 19 April 2019]; Available from: https://www.ukessays.com/essays/economics/blackberry-agriculture-economic-7631.php?vref=1.